On Criminal Minds Season 13 Episode 22, the BAU questions the credibility Agent Quinn's bizarre accounts of looking for an UnSub that he named "The Strangler." 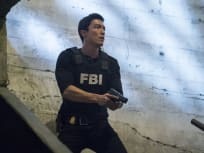 On Criminal Minds Season 13 Episode 21, when an UnSub is targeting his victims' temporal lobes, the BAU team is called to New Mexico to investigate. 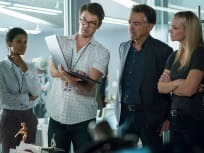 On Criminal Minds Season 13 Episode 20, when the Centers for Disease Control suspect bioterrorism is behind a series of mysterious deaths they call in the BAU. 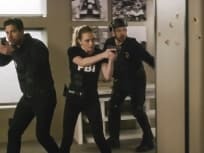 On Criminal Minds Season 13 Episode 19, when a hostage situation breaks out at a law firm in D.C., where Matt Simmons' wife works, the BAU team takes charge. 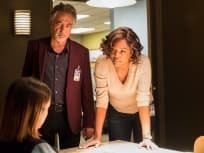 On Criminal Minds Season 13 Episode 18, Rossi gets a visit from his ex-wife, and the BAU heads to Chicago to investigate an unsub leaving roses on each victim. On Criminal Minds Season 13 Episode 17, when a murderous clown terrorizes the sleepy town of Guymon, Oklahoma, the BAU is called in to investigate. On Criminal Minds Season 13 Episode 16, the BAU meets in secret to investigate an UnSub who appears to be kidnapping and photographing young women. On Criminal Minds Season 13 Episode 15, when the BAU investigates a quadruple homicide, they are joined by the FBI's Asst. Director of National Security. On Criminal Minds Season 13 Episode 14, the BAU team investigates when New Orleans P.D. discovers a mass grave inside a vandalized above-ground crypt. On Criminal Minds Season 13 Episode 13, the BAU team investigates a series of D.C. murders where cryptic messages are found inside the mouths of each victim. "Bad Moon on the Rise"
On Criminal Minds Season 13 Episode 12, the BAU team heads to New York when several casualties of a brutal nature are reported in Central Park. On Criminal Minds Season 13 Episode 11, the BAU uncovers secrets in a small town when the BAU investigtes the attempted murder of a police chief's wife. 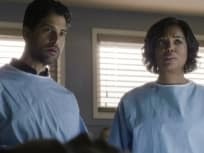 On Criminal Minds Season 13 Episode 10, the BAU team searches for an UnSub with a puzzling past, when a series of backyard pool homicides are reported. On Criminal Minds Season 13 Episode 9, the BAU is called to investigate when two members of a conspiracy group in Roswell, New Mexico die one after the other. 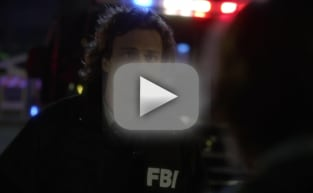 On Criminal Minds Season 13 Episode 8, the BAU is called in when an UnSub sensationalizes his crimes by giving the local media in Miami exclusive footage. 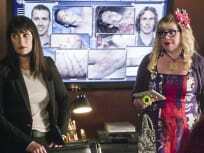 On Criminal Minds Season 13 Episode 7, when prominent members of the Austin, Texas community are targeted, the BAU team takes on the investigation. 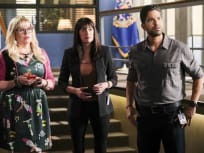 On Criminal Minds Season 13 Episode 5, Morgan visits to lend emotional support when Garcia experiences anxiety over a case that's personal to her from her past. 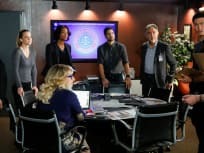 On Criminal Minds Season 13 Episode 4, when a state-of-the-art drone is used to commit a workplace shooting in Silicon Valley, the BAU team investigates. 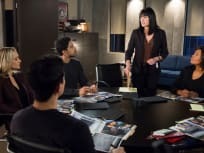 On Criminal Minds Season 13 Episode 3, when successful businessmen in Detroit are targeted by an anger-driven power-assertive unsub, the BAU is called in to investigate. On Criminal Minds Season 13 Episode 2, when there are three separate crimes in which victims' remains are discovered in old suitcases, the BAU investigates. 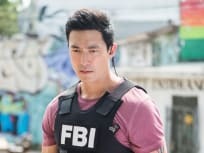 On Criminal Minds Season 13 Episode 1, Agent Matt Simmons joins the BAU team as they race to save one of their own and take down Mr. Scratch. Garcia: So, so badly. But we need to find Emily, so let's get to work. Permalink: So, so badly. But we need to find Emily, so let's get to work.